462 other birds have this item in their bag or wishlist! 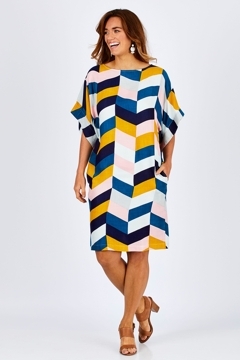 Handpicked by birds BEST SELLING STYLE, The Bell Sleeve Tunic Dress, features a delightful geometric print design using a very appealing mix of mustard, blue and pink. Love this dress as I'd bought it before but the patterns been recut and is no longer correct to size, too tight around hips and can only just get it over my head. My heads not that big. Will reorder but in a bigger size. Just tried my dress on and I can't even get it down past my chest. I don't have broad shoulders or really wide hips, if you're not a slim build then this dress isn't for you. There isn't any give in the fabric, so disappointed I have to send it back as love the print. Love this dress, a bright pattern, such a change from so much dark, plain fabrics on offer elsewhere. The only thing I would say is, there is no stretch in this fabric and I had to swap for a size 16 to accommodate my hips. I have bought this dress season after season and everytime I purchase it in the new print I am always complimented on it. I adore its flattering fit, good quality fabric and bright prints...not quite sure which print is my favourite. Lovely fabric, colours and pattern but this dress is entirely ruined by the pockets placed right on the hip in the side seams. Would have been a keeper but for these ridiculous non-functional gaping pockets. A lovely dress ruined by a silly current fad. What a shame. I loved the pattern but the fit was on the small side for my hips so if you are larger in the bottom / hip area either go up a size or give it a miss. Absolutely love the colours, pattern and design. Unfortunately it was extremely firm from the waist down. I was so disappointed. If I got an 18, it might be too big on the top. This dress was badly made and definitely not up to scratch. One side not symmetrical to the other around the hip area ie. reasonably straight on one side and rounded at the other. It therefore looks peculiar on and has been relegated to a "wear in the garden only" outfit.